Which Veinlite® model is right for me? Are Veinlite® products available outside the United States? Yes, we have distributors in most countries. Please look at our international page and click on your country to find a local distributor. If your country doesn’t have a distributor listed, please use the contact form on our contact page. What kind of warranty do I get when I purchase Veinlite®? All Veinlite®s and accessories, with the exception of halogen bulbs and non-rechargeable batteries, have a one year warranty provided there is no evidence of mishandling. If your Veinlite® develops a problem after one or two years, and the problem isn’t caused by mishandling or use without the disposable covers (in the case of the portable Veinlite®s), we will usually repair it at no charge. Customer must call to get authorization before sending any Veinlite® for repair. We accept returns up to 30 days from the date of receipt but they must be authorized. If, for any reason, a customer (individual or hospital) decides that any Veinlite® is not meeting their expectation, they should call us within 30 days of receipt to get a return merchandise authorization number (RMA#). Unauthorized returns will not be accepted and the cost of shipping will not be refunded. Veinlite®s produce a ring of bright light which is focused down and to the center of the ring. 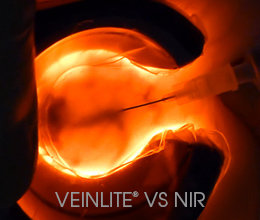 When a Veinlite® is placed on the skin, the light uniformly illuminates the superficial tissues inside the ring. De-oxygenated blood in veins absorbs the light so veins show as dark lines within the illuminated area. Placing gentle pressure on the Veinlite® stretches the skin and engorges the vein for easier needle insertion through the opening in the ring. 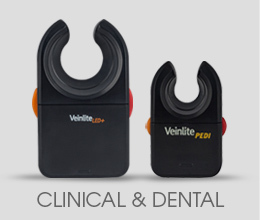 Portable Veinlite® models employ both red and orange LED lights. What is the purpose of those colors? The orange LEDs produce the best wavelength of light for absorption by deoxygenated blood in veins, so the orange light gives the best contrast for vein viewing. 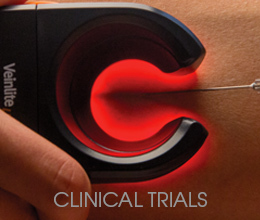 TransLite has a patent on the use of this wavelength of light for finding veins (Patent Number US 7,874,698 B2). 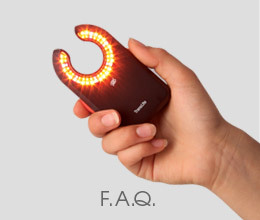 The red LEDs are used because they produce light with a longer wavelength that travels deeper into the tissues and penetrates darker skin better. What is the lifetime of the rechargeable battery in Veinlite LED+® and Veinlite LEDX®? The batteries will accept hundreds of charges so they last 3-5 years for most users who charge about once a week. It is best to fully charge the battery then remove the Veinlite® from the charger. 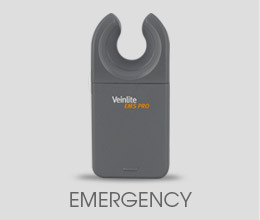 Leaving the Veinlite® plugged into the charger whenever it is not in use will shorten the lifetime of the battery. How long does the Veinlite® LED+/LEDX take to charge and how do I know when to charge? About 2-3 hours to fully charge but you can ‘top up’ the charge for a short time if necessary. Both models have a low charge indicator warning light (under the orange button) which will illuminate when the charge falls below 20%. Are there any precautions concerning the rechargeable battery in The Veinlite® LED+/LEDX? The Veinlite® LED+/LEDX battery is a standard lithium battery similar to a cell phone battery and contains a very small amount of lithium. Please consult the manufacturer's MSDS for detailed information. In the extremely unlikely event of leakage (less than 1 in 15,000), please contact TransLite to return the unit with the battery inside and do not handle the battery. I work with young children. Which model is most suitable? 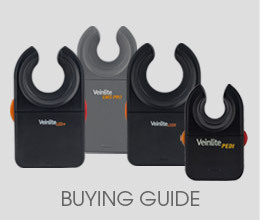 The Veinlite PEDI® is designed specifically for use on children from infants to 24 months of age. For children over 24 months, the Veinlite LED+® is best – it can be used on children of all ages. Will Veinlite®s work on obese patients? One of the reasons veins are hard to find is because patients are very overweight or obese. 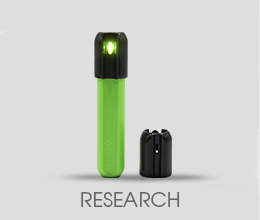 The Veinlite LEDX®, the largest and most powerful portable Veinlite®, is designed for this purpose. Do Veinlite®s work on dark skinned patients? Yes, Veinlite®s work on all skin tones: the red LEDs were included in the design of our portable model to ensure that they would work on darker skins. Our fiberoptic models produce powerful white light of a mixture of wavelengths so these also work well on dark skin tones. How well do Veinlite®s work in the dark? Veinlite®s are really great in low light situations. If you work nights in a hospital, you can place IVs without switching on the lights. If you are a paramedic who starts IVs outside at night, or in any dark situation, you will love our portable Veinlite®s as they give an even better view of the vein when the ambient light is low. How deep does the light go? The depth depends on the model: the light from the fiberoptic units penetrates up to a centimeter deep, and the light from the portable models penetrates slightly less, but the more important question is to what depth veins can be seen. Typically, veins can be seen up to 6mm if they are big enough veins to support an IV. Very narrow veins cannot be seen as deep. How durable and dependable are Veinlite®s? We have customers who have been using their fiberoptic Veinlite®s for 10 years. Our first Veinlite LED®s were sold in 2005 and are still in use. While we don’t recommend dropping your portable Veinlite® on purpose, everyone tells us they hold up very well! One paramedic dropped her Veinlite LED® out of her kit bag when picking up a patient. The patient’s dog was angry and ran off with the Veinlite LED®. Although the dog chewed it badly, leaving it covered in teeth marks and with a hole in the plastic casing, exposing the LEDs and the circuit board, it still works. See the photo here! Are there clinical studies that show Veinlite®'s effectiveness in IV access success rates? Yes, a study at Children’s Hospital Boston showed an increase in first attempt success rates for difficult IV placement. Other reports, like one from the Medical University Vienna have shown reductions in IV access failures. How do you prevent cross contamination? All the portable Veinlite®s comes with disposable plastic barrier covers for single use. 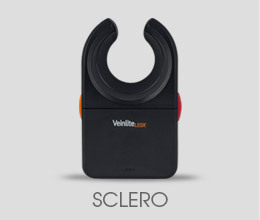 The Veinlite® II ring illuminator is autoclavable and comes with disposable barrier covers. 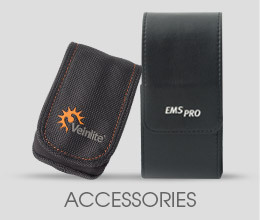 These covers also fit the standard Veinlite® ring illuminator. The Veinlite® and Veinlite® P ring illuminators are metal and can be cleaned with any alcohol, chlorhexidine or other medical disinfectant solution. Do you need a tourniquet? The great thing about Veinlite®s is that you don’t need a tourniquet. This is really useful on small children who cry whenever you use a tourniquet or on very frail patients with thin arms or those who bruise if a tourniquet is used. You can still use a tourniquet if you need to make the veins stand out more. Did you know that using a tourniquet for drawing labs can actually alter the blood chemistry? See this study for details. Can Veinlite®s be used to place PICC lines? Veinlite®s are great for use in difficult superficial IV access but the light doesn’t go deep enough for placing PICC lines. Do Veinlite®s work on animals? Unfortunately, NO. Animals like dogs and cats have skin that is not as translucent as human skin. Therefore, light does not penetrate very deep in their skin and transillumination does not work for these types of skin.